MOTTO: Serving the medical community for the benefit of the society. 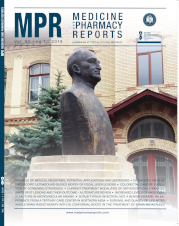 Medicine and Pharmacy Reports is a quarterly journal dedicated to the dissemination of progress in health sciences. The journal publishes original research, reviews, case reports, letters, and occasionally historical material, all peer reviewed. 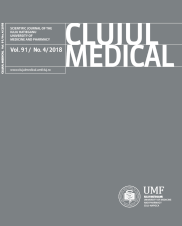 Medicine and Pharmacy Reports is published by one of the most prestigious medical schools in Romania and aims at representing a scientific forum in health sciences. It is open access and it promotes original papers of researchers worldwide, along with contributions of top specialists in the medical and pharmaceutical fields. The scientific standard of the periodical is maintained by the blind peer-reviewing of each paper submitted and by the analysis of the articles by the editorial board. The quality of the journal has constantly improved, as documented by its inclusion into the most prestigious databases, and it will continue to raise its standards of quality. Indexed: Scopus, Pubmed, Pubmed Central, EBSCO, SCIPIO, Index Copernicus, getCited, JournalSeek, Open Access Directory, InfoBase. The journal website is in the process of an upgrade. With all the care taken it might be possible to experience some unusual site behavior, therefore we apologize for any inconvenience. Valean S., Acalovschi M., Dumitrascu D., Ciobanu L., Nagy G., Chira R.
Neag M., A., Muntean D., M., Nacu A., Catinean A., Farcas A., Vesa S., Bocsan C., Vlase L., Buzoianu A. D.
Rusnac M., Gasparik C., Irimie A., Grecu A., Mesaroş A., Dudea D.
Balsaraf S., Bhambal A., Chole R.
Soheilipour F., Salehiniya H., Farajpour.kh M., Pishgahroudsari M.
Mishra P., Solanki J., Choudhary R., Sharma C., Sharma P., Shah D.
Mihaileanu R., Neamtiu I., Bloom M., Stamatian F.
Suteu P., Fekete Z., Todor N., Nagy V.
Jain D., Nand N., Giri K., Bhutani J.
Roshani-Asl E., Rasmi Y., Khadem-Ansari M.,-H., Seyed-Mohammadzad M., Rostamzadeh A., Ghaffari F., Mokarizadeh N.
Pop B., Fetica B., Blaga M., Trifa A., Achimas-Cadariu P., Vlad C., Achimas-Cadariu A.
Ichim V., Chira R., Mircea P.
Cosma L., Şuhani R., Mesaroş A., Badea Mîn. Sur D., Colceriu M., Sur G., Floca E., Dascal L., Irimie A.
Feldrihan V., Benea A., Junie M.
Anyfantakis D., Karona P., Kastanaki P., Kourakos A., Kastanakis M.